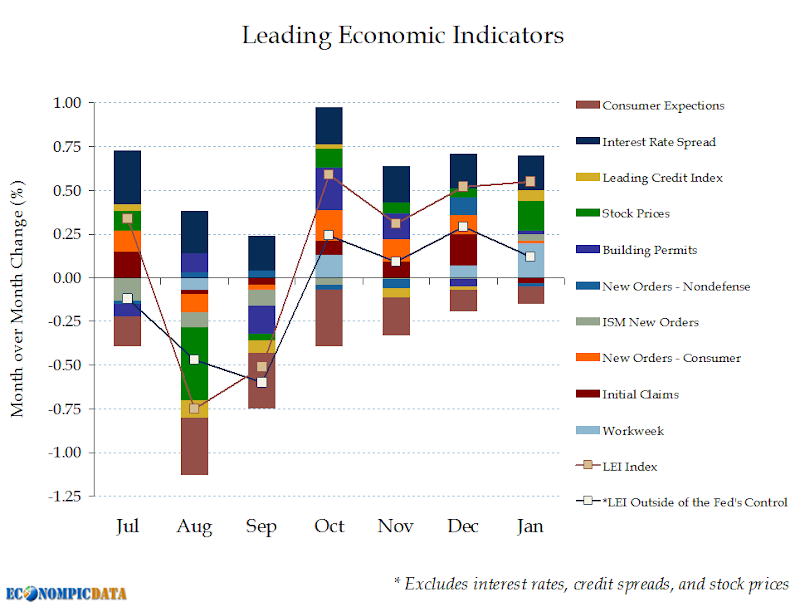 The reason "may" is in the title is because by my calculations, leading economic indicators grew by 0.55% in aggregate, not the 0.4% listed by the Conference Board (if you want to see for yourself, the components that add up to 0.55% are listed in Table 2). Perhaps the 0.4% is what the leading indicators would have shown under the old methodology (the methodology changed just last month... see here for details). Assuming the components are actually correct, the below chart shows that the "headline" (i.e. reported) LEI index continues to improve at a decent clip off of summer / fall lows, while "core" (i.e. those components not affected by the Fed) also continue to show expansion, albeit at a slower pace.